Early-to-mid 18th c. Bronze with painted cloisonné; lively sculpted bronze Fu-dogs and dragon heads. 7.5″h, 8″ w, 3″ d.
This incense burner is rare. It is made of bronze and has an insert of cloisonné panel on opposite sides of the body. The burner is distinguished by a metal domed-lid topped by a big, superbly sculpted big fierce-looking bronze lion-dog or Fu-dog (protector of the deity, Fu) perched on a sea of openwork clouds that take on the shape of the “lingzhi” (the sacred fungus symbolizing longevity and immortality), two equally lively small Fu-dogs climbing the sides as handles, and four dragon heads as legs. 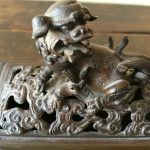 The Fu-dog is the protector of the god Fu, and the emblem of valor and energy. The long sides of the rectangular box have inserts of cloisonné panels decorated with scenes of flowers and birds. One panel shows a phoenix perched on a paulownia tree (once known in China as The Princess Tree as it takes on the name of a past Russian princess), and the other panel a crane flying towards a peony bush. These are emblems of nobility. The light blue cloisonné enamel surface has a matte finish and shows tiny dark pits which are caused by gas escaping from the bronze during firing. This is a characteristic of early enamelware when the technique of firing was not perfected. Inside the box are two short wood rods stretching half way up the sides, probably for the purpose of holding up a dish of incense for worship. 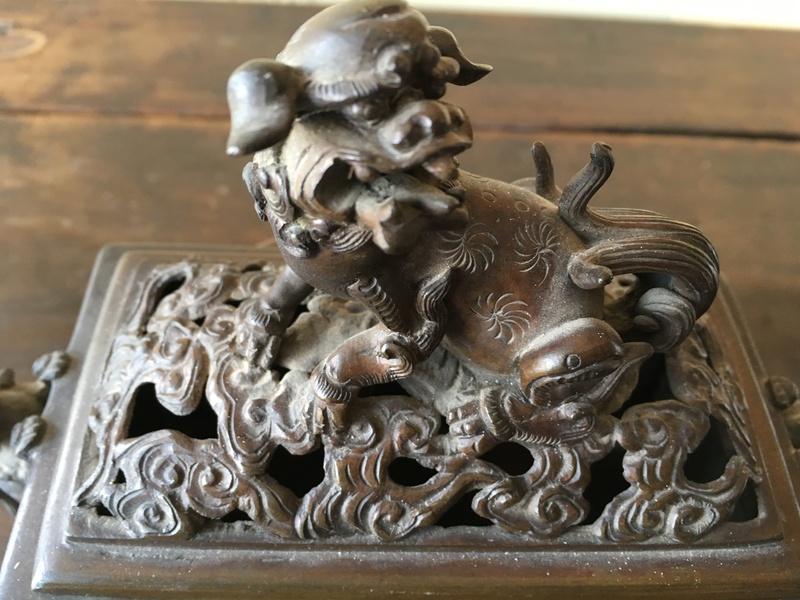 This incense burner is deemed rare because with its beautifully adorned bronze figures of lion-dogs and dragon heads, and inserted with cloisonné panels enameled with royal attributes, it was likely made for a member of the royal family. Like most religious vessels made for worship and not for celebrating a monarch’s reign at that early period, this incense burner does not have a reign mark. It age is attributed to characteristics shown. It came out of China in the 1900s with a descendent of two generations of missionaries in China. It was in his private collection until it came into our collection.